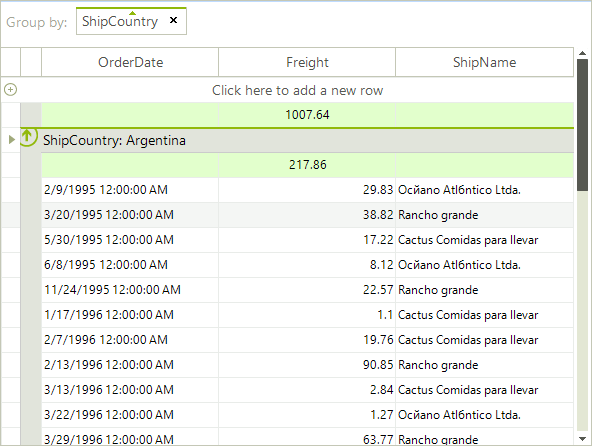 Summary rows are RadGridView's rows which allow you to display information about the data in the control such as first item, last item, count of items, etc. The summary rows are top and bottom pinned rows. 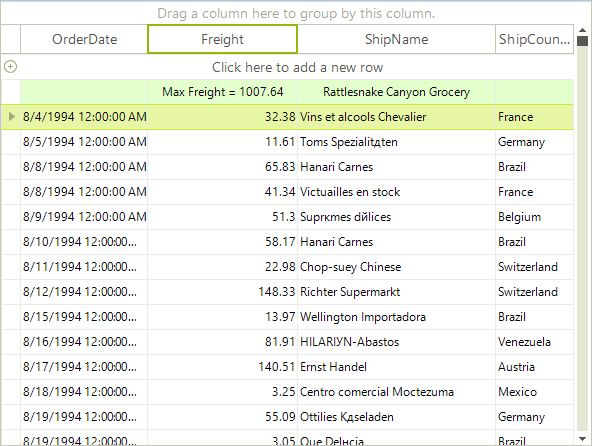 They can be used in a flat RadGridView or in groups and hierarchical views. 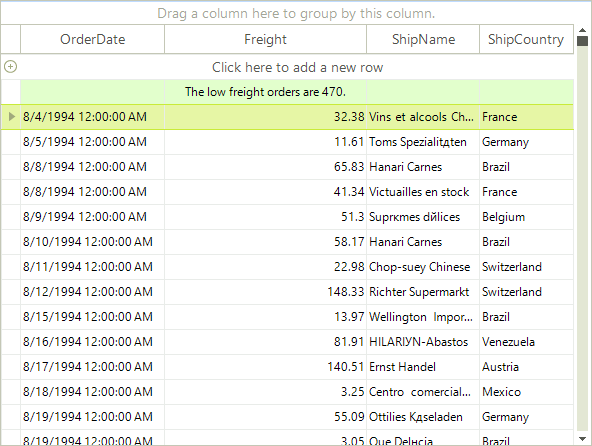 Name: The name of the column which the summary item refers to. Aggregate: The function which will be evaluated. AggregateExpression: The final expression to evaluate. FormatString: Formatting string which is applied to the calculated value of the summary item. None: No expression is evaluated. Sum: Returns the sum of all values. Min: Returns the minimum value. Max: Returns the maximum value. Last: Returns the last value. First: Returns the first value. Count: Returns the count of all values. Avg: Returns the average of all values. StDev: Returns the standard deviation of all values. Var: Returns the sample variance of all values. 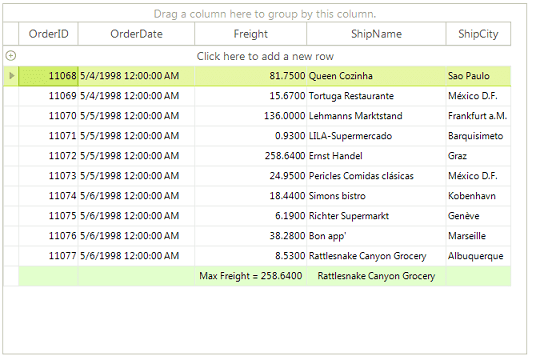 summaryItem.AggregateExpression = "(Sum(Freight) - Max(Freight) - Min(Freight)) / Count(Freight)"
When you use grouping, the summary rows are calculated for each group's child rows and displayed as top or bottom pinned rows in each group. Using the template's property ShowTotals you can define if total summary rows will be shown. They are calculated for the child rows of all groups and pinned at the top or bottom of all groups. 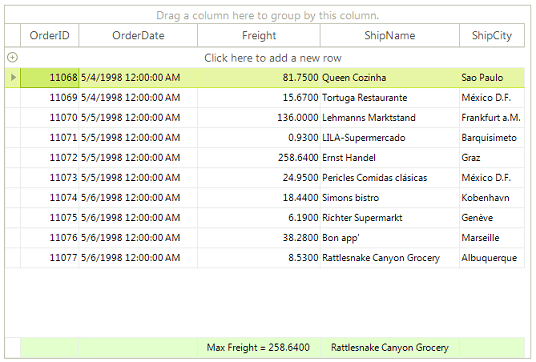 You can add summary rows in hierarchical views. 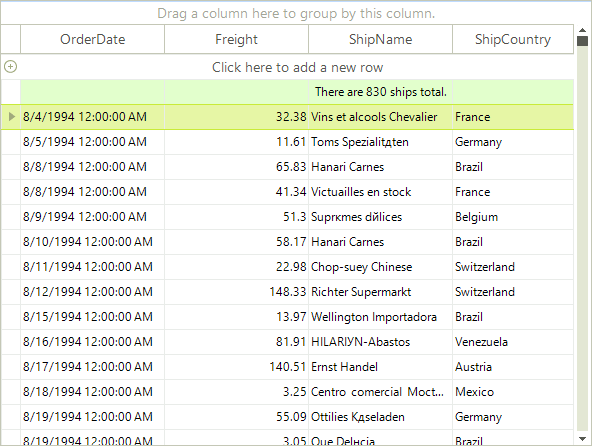 They are calculated for the child rows in the current view. 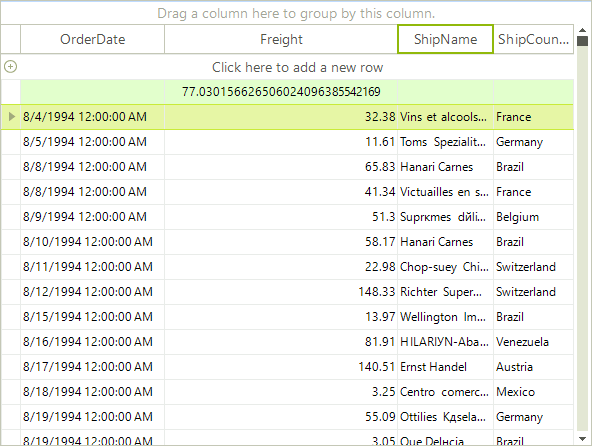 The same event is used to format the group header so it is important to check the Parent in the event arguments, as shown in the above example. You can write your own logic for summary items evaluation by inheriting the GridViewSummaryItem class and overriding the Evaluate method. Float: The bottom pinned rows will stay below the scrollable rows. If there are not enough rows to fill the viewport there will be no gap between the scrollable and pinned rows. Fixed: The bottom pinned rows will remain at the bottom of the viewport no matter how many scrollable rows there are in the viewport. 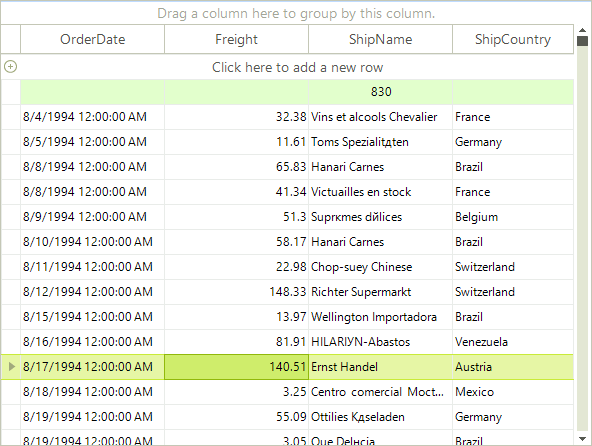 When you use the Fixed mode, it is necessary to pin the summary row accessing them by the MasterView.SummaryRows collection. Make sure to set the IsPinned property before setting the PinPosition.